 Home › Politics News › AMBODE BREAKS DOWN: Tinubu, APC Leaders Say No Way..Will Ambode Decamp? AMBODE BREAKS DOWN: Tinubu, APC Leaders Say No Way..Will Ambode Decamp? office in Lagos, he would need to man up and defect to the ADC or PDP, making it the first run through a gathering outside the control of Bola Tinubu will be responsible for Lagos since 1999. In any case, the inquiry presently is, does Ambode have the guts? Chances that Ambode will get his second term ticket diminished further at the end of the week following reports that the administration of Lagos APC has set out to see to his thrashing in the immediate essential, which will be held on September 25. It was reliably gathered by Tribune that all efforts by the presidency to wade into the feud between the national leader of the party, Tinubu and Governor Ambode were not successful. A source said both President Muhammadu Buhari and Vice President Yemi Osinbajo may have given up on the fate of the governor. “As things stand now, if he [Ambode] goes ahead for the primary, he will lose. And if he goes to another party to contest the coming election, his impeachment will be activated. That is the stage everything is now,” the very reliable source told Tribune. However, as s a decoy, it was learnt close associates of Senator Tinubu have tabled stringent conditions before the embattled governor which he must meet before they could consider shifting ground on his re-election bid. Although Tinubu is said to have repeatedly denied having any issues with the governor seeking re-election, his associates are believed to be speaking his mind. A neutral political heavyweight in Lagos State who has issues with both Tinubu and Ambode but is currently being wooed by the governor told Tribune that at a meeting with Ambode’s emissaries, he was told that the conditions put forward by Tinubu’s core political group, the Mandate Movement, would render the governor a lame duck if he signed off on them for re-election purpose. To further weaken him, allegedly, he is to hands-off the nomination process of all the candidates of the party for the House of Assembly, a condition which would make his impeachment easy if he tried to repudiate the agreement and reject the undated resignation letter as being signed under duress. 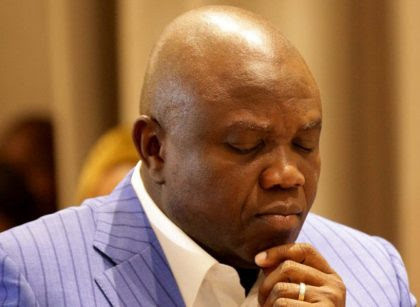 With the thinking on the other side that a re-elected Ambode may move against the political interests of those resisting him now, another condition being allegedly put forward is that the governor must seek Tinubu’s consent and approval before major policy decisions are taken, and funding for major projects must also go along that line. “Who does this? Why are they trying to disrespect this man (Ambode)? Is the governor a good leader? I tell you, he isn’t. I have told you some of the things he did personally to me. But he should be allowed to complete his eight years so as not to set a bad precedent. At least, nobody has accused him of not delivering on projects. I agree he has not done well with party leaders and members. The governor himself is surprised I could be sympathetic to his cause.